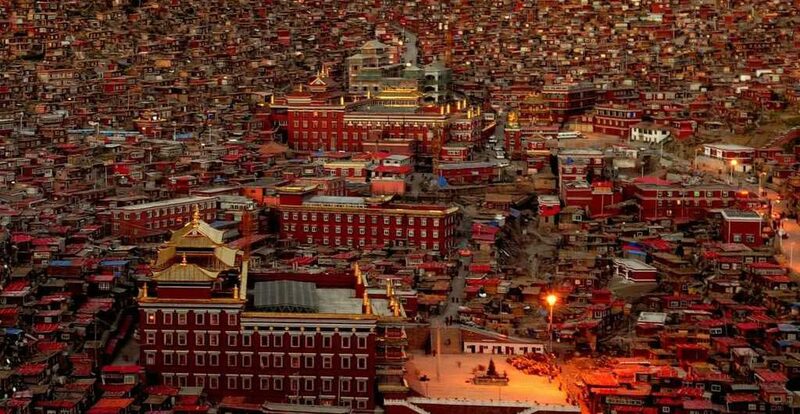 Seda Monastery is the largest Buddhist Institute in the world. It locates in Seda County of Garze Prefecture, Sichuan Province in China. There are about 10,000 monks and nuns in the monastery. And you will be shocked by the amazing view of red-roof houses on the mountain. Thus, standing on top of the mountain, you can feel the sacred atmosphere surrounding the place. Also, the night view of the monastery is quite impressive that you cannot miss. The monastery implements very strict disciplines to manage the monks and nuns. And there are strict rules to divide male and female monks including accommodation, study, etc. So, when you visit the monastery, please respect to their rules and behave yourself well. Another famous site is the sky burial platform near Seda Monastery. So, you can see the ancient and solemn ritual in the distance. But, remember not to take any photos without permission.